A small but stunning Oxlease mirror. A new PB weighing 32lb 15oz. 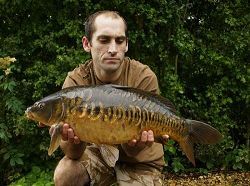 After a good session on Hunts Corner a few months ago I was desperate to get back out fishing and although the weather forecast wasn't the best, myself and Sara opted for a weekend on Oxlease on the Liner Fisheries Complex. We fished a spot 80 yards out and spombed out 4kg of hemp, sweetcorn, CC Moore Equinox 15mm boilies and CC Moore Response and Cream Liquid. My first fish came from the baited area at around 1am on Saturday morning and after taking out all my other rods I finally got a 16lb 1oz Common in the net. This fish fell to a CC Moore Northern Special Pink 12mm Pop Up. Our next fish all came later that morning, a stunning 8lb linear caught using Betalin & Black, and a 24lb 13oz mirror on a Northern Special Pink Pop Up for me. 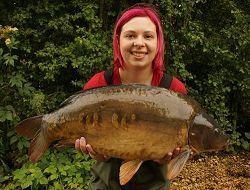 And a 12lb 10oz and 15lb 6oz Mirror for Sara both on corn soaked in Betalin & Black. We had no more fish on Saturday and after recasting all the rods and topping up the bait before dark my next bite didn't come until early Sunday morning. After a good fight I slipped the net under a chunky mirror when my second rod had a take. 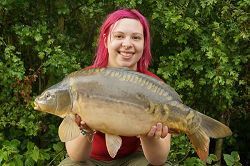 I only had one net made up so Sara had slip the net under the second fish, a 10lb mirror, whilst not letting the other one escape as I was confident that it was a biggy! After a quick photo with the 10lb mirror I carfefully lifted out the larger fish and seeing it on the Fox Easy Mat I was pretty sure I'd broken my PB and long time goal of catching a 30lb carp. It weighed in at 32lb 15oz and I was over moon, a great way to finish the session for me. 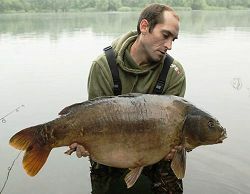 This fish fell to a CC Moore Northern Special White Dumbell Wafter over the baited area. Sara finished the session with a 10lb 10oz mirror and a nice tench. We had 8 carp in total and 2 tench and went home very happy anglers. All fish were caught using Fox Exocet mainline with a Fox Illusion Trans Khaki leader in 20lb. Hooklink was15lb Fox Camotex in Dark Camo with Horizon 3.25lb leads, SSBP size 5 hooks and Fox shrink tube. All the best - Luke and Sara.